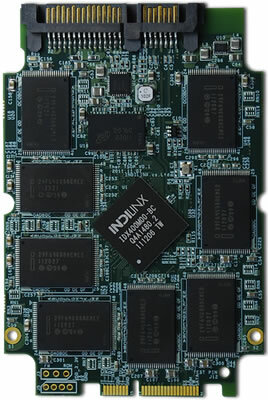 Putting its Indilinx purchase to good use, OCZ has unveiled its second-generation Everest solid-state drive controller. Announced last July, the original Everest only hit the market about two months ago inside the affordable Octane SSDs. The current iteration includes dual ARM CPU cores, peak sequential transfers of 500MB/s over SATA 6Gb/s, support for MLC NAND and three-bit-per-cell NAND, up to eight channels of ONFI 2.0/Toggle 1.0 Flash at up to 200MT/s, as well as support for NCQ and TRIM. The Everest 2 is expected to ship this June, presumably with the second wave of Octane drives, bringing additional enhancements to OCZ's in-house solutions. Instead of replacing its numerical predecessor, both controller designs will co-exist for a while, according to AnandTech. The original chipset is aimed more at the mainstream market, whereas the Everest 2 will focus on small block performance and reducing write amplification, bringing it up to par with the fierce competition in the premium market. The new controller touts up to 550MB/s reads and 500MB/s writes, 90,000 random write IOPS (4KB incompressible), as well as support for up to 2TB in a 2.5-inch package. AnandTech also notes that, because it's expected to deliver performance suitable for workstations and servers, the Everest 2 could find its way inside OCZ's next-gen Vertex drives. Like most players, the company's existing flagship series relies on SandForce's SF-2200, which was released nearly a year ago and is also due for a refresh. In related news, OCZ has agreed to supply LG with Everest-based mSATA SSDs in the PC maker's thinnest notebook to date, the Super Ultrabook Z300. "We are excited to continue our partnership with LG Electronics and provide our Indilinx Everest based OEM SSDs for integration into the company's exciting new Super Ultrabook Z300," said Ryan Petersen, CEO of OCZ Technology. "These custom OEM Indilinx SSDs are the ideal solution for the Z300's ultra slim and stylish form factor, and help deliver a superior overall computing experience for customers with quicker transfer speeds and faster boot up."